Some properties impress more than others, that goes without saying, offering some fabulous features which simply “Wow” the visitor right from the beginning. Nothing does this better than an impressive entrance hall and staircase. These two features alone can set the scene for more of the same to come, and help the visitor to appreciate the overall style of the property, the type of living experience to be enjoyed, the atmosphere, indeed the karma, within its walls. First impressions are always important and when you have your property up for sale – you really do need to make sure that everybody who comes to view leaves with a good impression. It may not be exactly what they are looking for but, at least the experience of viewing your property will have been a pleasant and memorable one. And you never know… even if it is not for them, they may talk about the experience of viewing it favourably to family or friends, who might just be looking for that exact type of property and lifestyle. 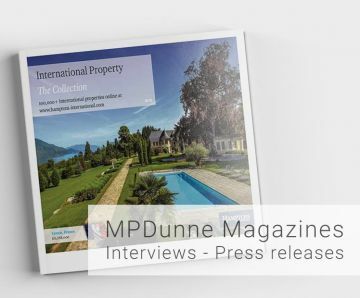 For more hints on how to present your Marbella property in its best light to possible purchasers, click on Preparing Your Property For Viewings. 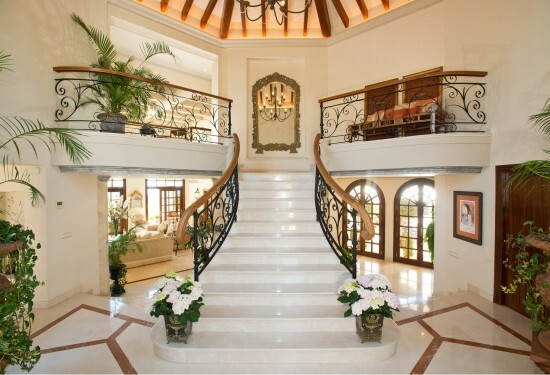 Scroll on to see some of our “Show-stopping entrance halls and staircases” currently on the Marbella Property Market. Whether it is a modern staircase made of steel and glass, an Andalusian rustic-style set of stairs with iron bannisters, an Imperial style stairway complete with lovely landings, or the more classical “sweeping” stairs reminiscent of “Gone with the Wind” with only Scarlett O’Hara missing (! ), we are sure you will agree that they are indeed “impressive”!! Please see our selection of some of the most spectacular Marbella villas for sale.